Excellent for apple juices, pies and cakes. 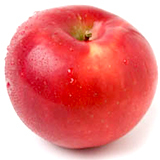 First developed at the University of Idaho Agricultural Experiment Station in 1942; it is a cross between two apple varieties (Jonathan x Wagener). The Ida Red has a white flesh with a firm body, and generally considered to be tart and juicy. Suits your every use! Eat fresh or for cooking. Favored for sauces, pies and desserts. Texture holds up wellwhen baked. Idared is harvestet at the end of September to the middle of October.